Friday, Feb. 12, 2016, was a day for science. 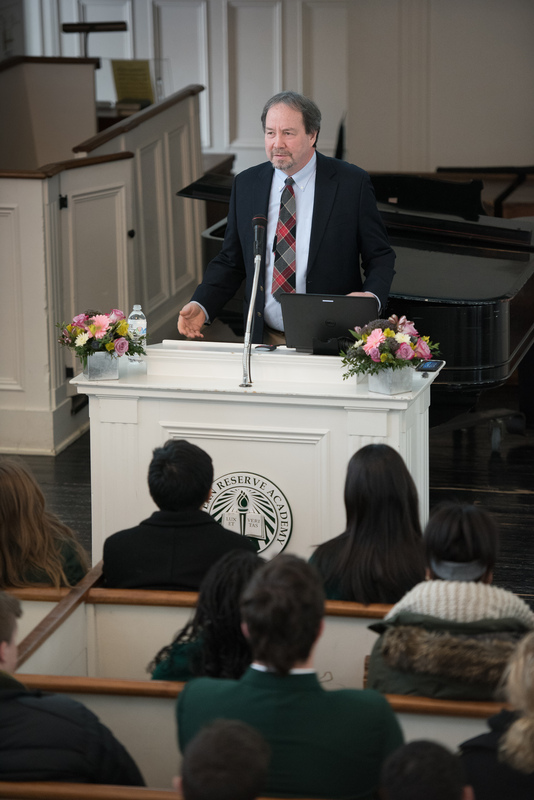 On that morning, Dr. Glenn Davis Stone ’72, last year’s Morley Medal recipient, delivered his Morley Medal talk to students, faculty, staff and friends of the WRA community. All who attended were treated to an insightful presentation on a subject in which Dr. Stone is an expert — genetically modified organisms (GMOs), their application in various industries and their rapidly developing political influence. To begin, Dr. Stone expressed his excitement about returning to campus, where he remembered being a student, although not a very dedicated science student. He remarked about the difference in the school’s science curriculum, and his happiness at discovering the opportunities students have to delve into the scientific world. He was struck by the exposure students’ receive not only to the science of cancer immunology, but to the political and economic context of science. “I think I would have been a scientist much earlier if I had understood the political waters in which scientific fish swim,” he said. Dr. Stone’s objective was not only only to dive into the history and development of the highly controversial GMOs, but to introduce his audience to the significant role politics plays in the scientific world. By the end of his presentation, Dr. Stone had achieved his goal. 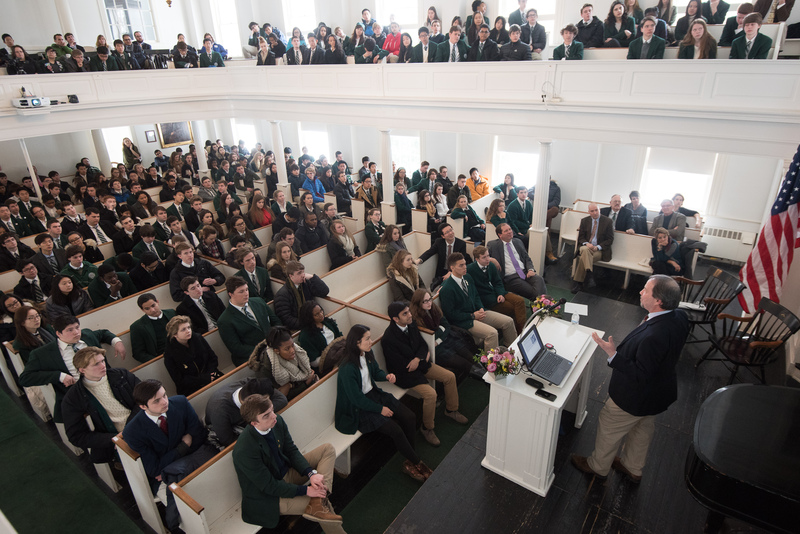 Many students asked thoughtful questions during the Q&A, and when the allotted time for questions had run out, several students lined up at the front of the Chapel to continue the discussion. Dr. Stone was awarded the Morley Medal for his work in anthropology of agricultural systems and biotechnology. He is a leading authority in his field, teaches at the Washington University in St. Louis, has contributed significant research and has traveled extensively in his career. Dr. Stone has also worked on various projects, including an examination of indigenous knowledge and technology change among rice and cotton farmers in India and the Philippines, specifically targeting the effects of “Golden Rice,” a genetically engineered variety of rice developed to produce pro-vitamin A (beta-carotene). Dr. Stone’s work has set new standards for understanding the integration of modern science and biotechnology into indigenous economic, political and social systems and benefits farmers, managers, policy makers, corporations and others affected by the GMOs. The Morley Medal award honors an alumnus or alumna for outstanding scientific achievement in the field of basic or applied science, or the application of science, technology or engineering to benefit the human condition. Since its establishment in 2003, the Edward W. Morley Medal has been bestowed to an alumnus/a for scientific achievement. Whether the recipient has produced a collection of accomplishments or made a career of scientific excellence, the beneficiary is honored for their contribution and service to a field of basic or applied science, or to the application of science, technology or engineering to the improvement of the human condition. Named for Edward W. Morley, the award celebrates the Western Reserve College (now Case Western Reserve University) faculty member, who taught in the late 1800s and early 1900s. His most-recognized contribution to the scientific world is his Michelson-Morley Experiment of 1887, in which he attempted to measure the velocity of the Earth and the speed of light, the results of which helped pave the way for Albert Einstein’s theory of relativity. In 1902, Morley was nominated for the Nobel Prize in Chemistry. Watch a recording of the presentation.